Learnodo Newtonic will help you expand your vocabulary quickly by introducing you to root words. A root word is a word from which other words are derived by adding suffixes and prefixes. 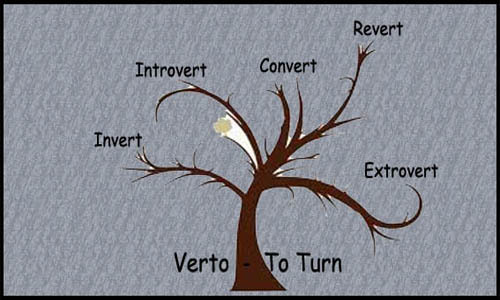 For example ‘Verto’ is a Latin root which means ‘to turn’. We get words like invert, revert, convert, introvert, extrovert from that root. In a previous article we have discussed how you can learn words easily. We will be using those techniques to help you in learning root words. I picked the wrong man to question! “It’s a cigar, you idiot!” was my brother’s reply. He emphasized on the idiot warning me not to disturb him during the film. How to expand your vocabulary quickly? That is the question??? The point is that I never forgot what a cigar was. Not due to my brother’s rude reply but for the simple reason that cigar sounded very much like cigarette and I easily associated the word with cigarette. Learning root words to remember a bunch of words together is a similar thing. It helps you to club words together in your memory and is a great way to expand your vocabulary quickly. Whenever you learn a new word from a root, it is easy for your brain to associate it with other words formed from that root which you already know. This helps in forming memory connections which help you to remember the new word you learned. Malaysia – the bad country of Asia? Mal is the Latin root for bad. Once you know that mal stands for bad, you don’t need a dictionary to know the meaning of words like malfunction, malnutrition etc. Also you have a general idea when you come across other words containing mal like malignant and malevolent. I mean that you can guess these words have a negative connotation. When you hear that someone has a malignant tumour, you know the condition of the patient is serious. Imagine you are answering a multiple choice question in an exam and they ask you what malevolent means? If you know that mal means bad you can easily narrow down your choices. To expand your vocabulary quickly, learning root words is probably the best way as you open up to a lot of words by learning a root and more importantly you can easily form a relation between the words you learned. Learnodo Newtonic will not limit itself to using root words. We will try clubbing other words too and weave stories to help you remember them as a group. Watch this movie to get a better idea!